I had great plans for my Thanksgiving table this year, but I waited too long to decorate. I could not find even one pumpkin last week! I did find one lonely mum in a Halloween basket that I grabbed, but I already killed it. Yes, in one week. Oh, well. Thankfully, I always have my hurricanes and large mercury glass vase that works in a pinch. I can get so many different looks by switching out the branches and vase filler. My dining room is on the formal side and already has a mix of silver and gold décor, so I just added glittery branches and pinecones in the same colors. You might notice the new pictures and sconces. Yes, this dining room is finally done! Well, there are always little details I would love to add, but they are minor and can be added later. I really wish I had room for a buffet, but it’s more important to have the biggest table possible with almost all of my extended family living nearby. I keep picturing a mirrored buffet piece under the sunburst mirror. Wouldn’t that look great? I think so too, but I just don’t have enough space. 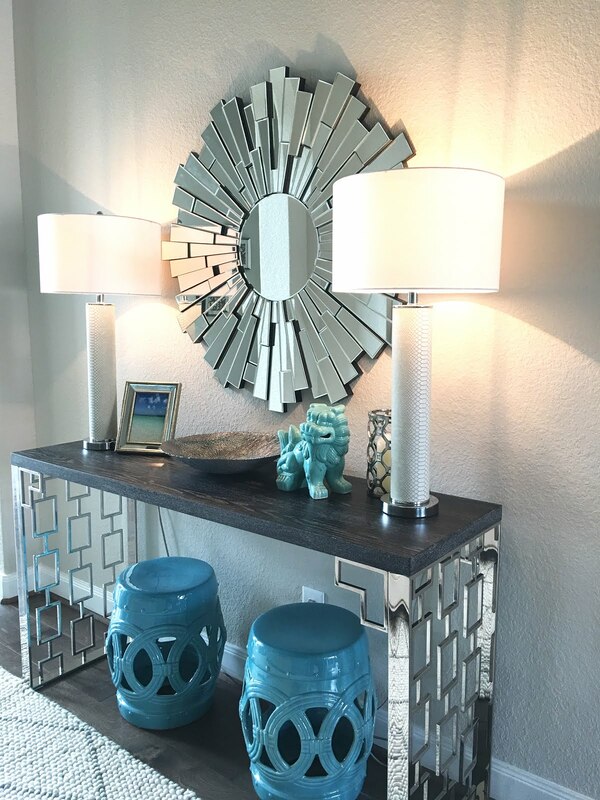 I wasn’t sold on the sconces for the longest time, but I’m so glad I didn’t return them. Once I added the LED candle I just loved the ambiance they create. Isn’t that what we always look want in a dining room? My husband says they remind him of being in New Orleans. There’s that too, I suppose. Men always have the funniest comments when you ask for their opinion. The copper mercury glass candleholders on the table were from my fall mantel, which is now all decorated for Christmas. I moved all my fall décor to the entry and dining room, and only decorated the great room for Christmas since I’m hosting Thanksgiving this year. I didn’t want to disrespect Thanksgiving! Actually, it doesn’t matter to me since Thanksgiving isn’t about décor for me. It’s all about the turkey, baby! I know not everyone feels this way so it might be Christmas in the back of the house, but it’s all Thanksgiving in the front. My owls from the mantel found a new place on the console table (along with my half dead mum). The view as you walk in the door. I like that the dining room mirror and artwork can be seen from the front door. It feels so fancy! The dead mum kind of ruins it though and Mario is photobombing again. Very pretty...hope you had a wonderful day!